1. 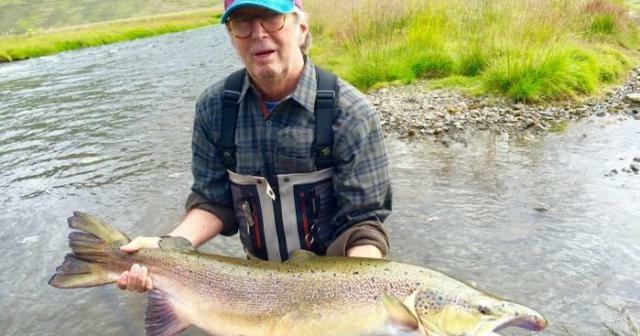 Eric Clapton lands a record contract...er...record salmon. This is what the world needs - pictures of 71 year-old blues players holding fish. OK. Maybe it's not stupid stuff. Maybe it's not even silly. But I just could not resist sharing. Next? Ginger Baker cuddling with kittens. 3a. The corruption associated with Qatar's award of the 2020 World Cup leads to the resignation of FIFA President Sepp Blatter. But Qatar will still host the tournament. 3b. A climate-change induced heat wave has led to the Arabian Peninsula experiencing the highest temperatures ever recorded in the Eastern Hemisphere at the very time of year that the World Cup will be held. But Qatar will still host the tournament. 3c. Architect Albert Speer is designing the new, climate-controlled stadiums. Yes, he is the son of THAT Albert Speer, Hitler's architect. Oh, snap! 4a. The Donald's economic advisors recommend cutting taxes. Should we be surprised that it took a roomful of megamultimillionaires convened by a billionaire to come up with that one? Look, guys. The last President for whom a tax cutting strategy worked economically was Kennedy. Anyone who's bothered to actually do the math since realizes at this point that a rising tide only lifts yachts. 4b. Trump spokeswoman blames Obama for invading Afghanistan. That was before he changed the rules of engagement that led to Captain Kahn's death in Iraq...in 2004. And after he led the Vietcong over the border into the South...in 1955. 4b. “If she gets to pick her judges, nothing you can do, folks. Although the Second Amendment people, maybe there is, I don’t know.” Oh, snap!